If you’ve read our “What’s In My Frack Fluid” article, posted by David last week, you were probably disturbed to find out how much of the ingredients used in a typical hydraulic fracturing operation are unknown. We thought it might be a good idea to illustrate what 133 tons of chemicals (including 65 tons of unknown chemicals) looks like. So Paul and I got to work in Google Sketchup creating the Frack Family. The Fracks are an imaginary family who live near the very real Marcellus Shale natural-gas drilling and fracking site in Beaver County, Pennsylvania featured in David’s blog post. They agreed to let Chesapeake Energy store all the chemicals that were used at this frack site right on their lawn… such a sweet family. We uploaded the Frack Family into Google Earth Pro and took some screenshots to help you visualize how much chemicals are being used, and more disturbingly, how much of those chemicals are what David calls “mystery” chemicals. The imaginary Frack Family at their Beaver County home, with fracking chemicals stacked up in 42-gallon barrels on their front lawn. We’ll start off with an introduction to the Fracks and their dog, Rocky. Above, you can see them standing by a glowing green 42-gallon barrel that represents the 380 pounds of Ammonium Persulfate used in the fracking solution and a few of the 32 lavender colored barrels that represent nearly 6 tons of Potassium Hydroxide. As we back up, shown below, you’ll notice 235 blue barrels to the right of the Fracks. These barrels represent the 41 tons of Hydrogen Chloride used to make hydrochloric acid. 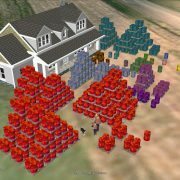 The imaginary Frack Family at their Beaver County home, showing the 384 barrels of known chemicals used to frack the well near their house. Finally, the Frack Family would like to show you the amount of chemicals for which no Chemical Abstract Service numbers are disclosed on the ingredients list — which is voluntarily provided by Chesapeake Energy Appalachia LLC via FracFocus.org. These “mystery” chemicals are represented below by 373 bright red barrels and weigh a total of approximately 65 tons. That is about half of all the chemicals used for this one fracking job, which is 1.7% of the total weight of the mixture used (the other 98.3% by weight being water and sand). We cannot be sure exactly what these chemicals are… but it’s only less than 1% of the frack job, right? 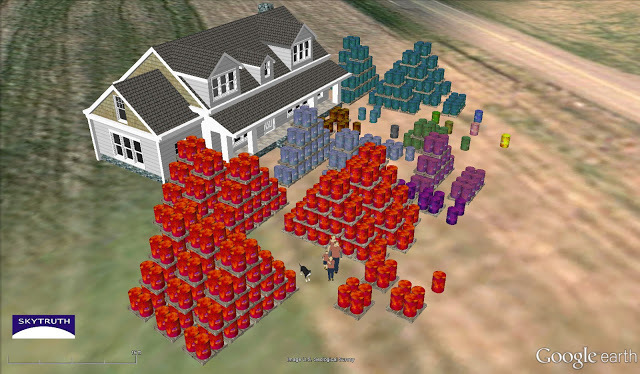 The imaginary Frack Family at their Beaver County home, showing off the 757 barrels of chemicals used to frack the well near their house – including 373 barrels of “mystery” chemicals. Joking aside: all of these chemicals had to be trucked onto the drilling site. That’s a lot of truckloads of chemicals, including hundreds of barrels of unknown substances, being hauled (in a hurry) over typically small, light-duty, winding country roads, past homes, businesses, and schools. That’s pretty serious. Wow this came out amazing! Great job! Thanks Unknown! There are engineering reasons for the chemical additives used in fracking fluid, to give it the desired behavior (viscosity, friction, etc) under the temperature, pressure and reservoir chemistry it's going to encounter. Using the wrong "recipe" could have the opposite effect, causing undesirable chemical changes in the reservoir that might actually reduce the ability to produce gas, so I doubt the industry would try to use fracking fluid as a way to dispose of unwanted chemicals. Great illustration! The industry has a wonderful script of telling the public that they only use about 1% in chemicals and that you can commonly find them in your food products or under your kitchen sink. I can't remember the last time I drank a tonic of hydrochloric acid mixed with ammonia. The last time you drank hydrochloric acid was the last time that you drank water from your city water fed tap. Or swam in a public pool. Dilution greatly changes chemical properties. The chlorine that is used to disinfect public water and swimming pools significantly raises the pH. Hydrochloric acid is used to lower it back down to acceptable levels. As far as the comments made by the author, these chemicals are diluted when they are put into the ground. The same way that the exhaust your car emits would kill you if you let your car run in your garage, but are generally harmless when you drive down the road and they dissipate (dilute) into the air. Which is all a moot point, as it is EXTREMELY RARE for these chemicals to end up in ground water. The only way they have made their way into aquifers is from surface spills, which are usually very apparent and can be mitigated. This is a gross oversimplification, one that leads the readers far from the direction of the accurate assessment of the risks involved with drilling. I'm not denying that there are some, but they need to be presented in the proper context, not in a manner that conveniently evokes an unwarranted emotional response in people. This post isn't about water contamination, but Mike's comment raises an important issue: companies are not disclosing the identity of many of the chemicals used during drilling and fracking. This means that homeowners don't have the information they need to test their well water, to 1) make sure that it isn't being contaminated by drilling activity, and 2) establish a legally admissible pre-drilling "baseline" test of their water quality so they can protect themselves in court should they suspect that drilling has contaminated their water. This is fundamentally unfair. Besides, if there is little to no contamination of water as a result of drilling, then why is industry fighting hard to keep these chemicals secret? As for ground water contamination from drilling-related activity (be it fracking, surface spills, blown casing, inadequate cementing, whatever) being "extremely rare," I don't think that conclusion has been scientifically established. It's barely been studied, partly because there's been little pre-drilling baseline testing of ground water that would allow a scientific conclusion, partly because nobody knows what chemicals they should be looking for. Full, publicly transparent disclosure of all the chemicals used in drilling and fracking would enable scientists to answer this tremendously important question. In the meantime, I'm personally not comfortable relying on industry and government assurances that everything is perfectly safe and there's nothing to worry about. Coming back to the blog post, I think it is fair for us to point out that all of these chemicals, in their undiluted form, have to be transported to the drilling site. That's a traffic, air pollution, noise and safety issue that effects everyone's quality of life wherever drilling is happening. Does this mean don't drill? Some people might say it's worth it; others might decide differently. Worth noting that a 4,700-gallon hydrochloric acid spill was just reported from a drill site in Leroy Township near Bradford, PA (https://stateimpact.npr.org/pennsylvania/2012/07/05/4700-gallons-of-acid-spill-at-bradford-county-drilling-site/). Some of the acid ran offsite and caused a fish kill in a tributary to Towanda Creek. I live in Arlington TX and when I found out this drilling was to be by my family, I studied the process full time for a good two years. In addition to the huge amt of chemicals used, the technology is not there yet to do this safely by people. Even if they use electric instead of diesel rigs to drill, the diesel compressors and generators spew VOC's. During fracturing, the sand catching pillow case/socks fail to mitigate toxic, silica dust exposing workers and residents/students into the neighborhoods/schools. And during flowback, even if they use Green Completions equipment (separator/pipeline), the topflow at the beginning stages of flowback allow hydrocarbons to escape from the OPEN HATCH flowback tanks. They need to use gas buster (degasser) equipment, but it is not mandated by any local,state or federal laws so even the EPA missed that one, so the un-sale-able/dirty gas is being vented into our airshed. There aren't any rules either to mandate that the wells get flowed back right away after fracturing. The 3 wells frac'd by my house last month by the Cowboy Stadium will not be flowed back this year until the pipeline is in place, and so stale flowback (sour well) with dangerous sulfides emissions are very likely. This happened once before at another Chesapeake (Lynn Smith) drill site last March where 911 had to dispatch paramedics for Jean Stephens who was stricken in her own parking lot. There is one big red line through all the Industries information, LIES, LIES and more LIES. What is 1% of 1 Million gal =10000gal and often there is way more water used the just 1 Million gal. Often the fracking process is repeated several times in the same hole. So the accumulation of these toxins is unbelievable and so is the risk of transporting it. In most regions there are not enough first responders to mitigate any accidents. There is only one (1) Solution; Total Ban of fracking. We don't need this, we have to put the moneys into renewable energy installation, not even research then that is done a long time ago, use the technology available. Renewable energy creates much more jobs the oil & gas and the most important thing much healthier jobs. What Renewable Energy doesn't do is lining the already full bank accounts of the 1%.